children and young people of school age. You might also like to look at our information on Education, Health and Care plans (EHCP). When is an EHC needs assessment necessary? Who can ask for an EHC needs assessment? What happens when the local authority gets a request for an EHC needs assessment? What happens if the local authority decides that an EHC needs assessment is not necessary? What happens if the EHC needs assessment goes ahead? What if some of this advice is already available? When does the EHC needs assessment end? What if I do not agree with the local authority about the EHC needs assessment or the EHC plan? My child already has a Statement. Will they have an EHC needs assessment? An EHC needs assessment is a detailed look at the special educational needs (SEN) of a child or young person and the support he or she may need in order to learn. Local authorities are responsible for carrying out EHC needs assessments under the Children and Families Act 2014.
the special help they need. other professionals who work with or support your child. The assessment is to see if your child or young person needs an Education, Health and Care plan (EHC plan). The school or early years setting can often give your child help through SEN support. This means that the school makes additional or different provision from that provided to most other pupils to meet their needs. Sometimes other professionals will give advice or support to help your child learn. Some children need more help than the school can provide. If your child does not make progress despite everything the school has tried, an EHC needs assessment might be the next step. your child’s physical, emotional and social development and health needs. The law states that if your child has or may have special needs and may need provision to be made via an EHC plan, the local authority must conduct an EHC needs assessment. This means that you do not have to prove that an EHC plan is definitely necessary to obtain an assessment, you just have to show it may be necessary. If you think your child needs more help than the school can provide, you can ask for an assessment. Some children and young people will have needs that clearly require an EHC needs assessment and EHC plan. Immediately the local authority is aware that this is the case it must start the process without delay. You can find out more about the criteria that local authorities should follow in the SEND Code of Practice sections 9.3 and 9.14 to 9.16.
the early years setting or school but only after talking with you first. It is always a good idea to talk to the school or early years setting before asking for an EHC needs assessment. SSIASS can help you make your request. Other people, such as your doctor or a health visitor, can tell the local authority that they think your child needs an assessment. As soon as the local authority gets a request for an EHC needs assessment they must tell you about it. The local authority has up to six weeks to decide whether to make a needs assessment. During this time it may ask you, the school and other professionals for information. that an EHC needs assessment is not necessary. how to get further information, advice or support. If you disagree with the decision, SSIASS can explain your options to you. The local authority will write to you to tell you what will happen and ask for your views. Your views and your child’s views are really important. SSIASS can give you information, advice and support to help you with this. the special educational, health and care provision that might be required to meet their needs and achieve the desired outcomes. anyone else you ask them to contact who may be able to give relevant advice. If your child has a vision or hearing impairment the local authority must also seek information and advice from a suitably qualified teacher. The local authority should also try to find out your child’s views. You, the school and other professionals may be able to help with this. If you think your child needs someone to help them give their views you can ask SSIASS for more information about this. You will have the chance to discuss your child with everyone involved in the needs assessment and you will receive a copy of all the reports when the needs assessment is finished. If you want information, advice or support during the EHC needs assessment contact SSIASS. You can find out more about advice and information for EHC needs assessments in the SEND Code of Practice sections 9.45 – 9.52. Sometimes advice and information is already available because other professionals have been working with your child. Once the local authority has all the information and advice it must decide whether your child needs an Education, Health and Care plan. An EHC plan is a legal document written by the local authority. It describes the special educational needs that a child or young person has and the help that they will be given to meet them. It also includes the health and care provision that is needed. You can read more about EHC plans on Surrey’s Local Offer SEND resource page. Sometimes the local authority will decide that your child has special educational needs that can be met through SEN support. If this is the case the local authority must tell you of its decision within 16 weeks of receiving a request for an EHC needs assessment. The local authority must also tell you about your right of appeal. If the local authority decides an EHC plan is necessary it must first write a draft plan. It will send you the draft EHC plan and copies of the reports so that you can read it all. You should check that everything you think is important has been included and that you agree with the outcomes and the proposed provision. The local authority will also ask you which school you prefer your child to go to. You have 15 days to make comments, to ask for a meeting or accept the draft plan. Note that if you do not reply within 15 days the local authority may assume that you agree with the draft plan. 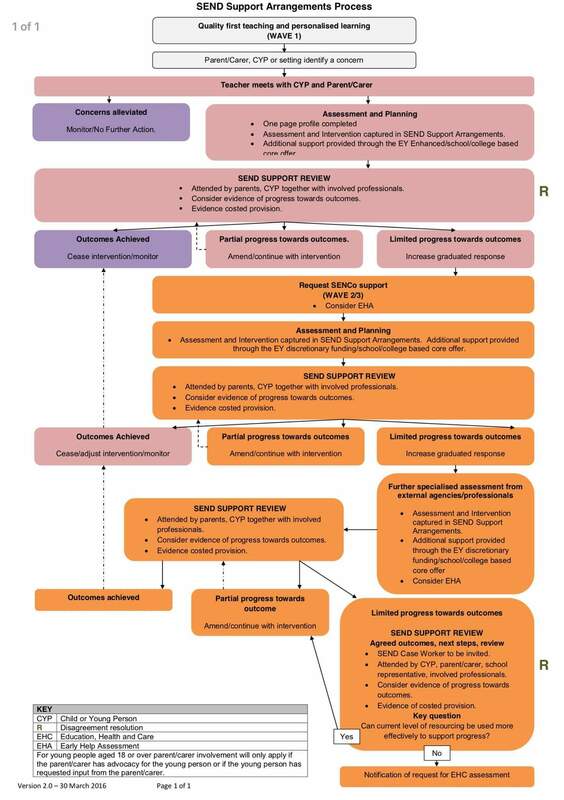 The last stage is for the local authority to send you the final EHC plan. If you are still unhappy with the plan or cannot agree with the local authority on a school, you have a right to go to mediation and/or to appeal (see below). If you need help at any stage you can contact SSIASS. Sometimes this timescale can be different. See SEND Code of Practice section 9.42. At any stage you can ask to talk to a member of the local authority’s staff. This will usually be the person named in the letter the local authority sends to you when it receives a request for an EHC needs assessment. If the local authority decides that an EHC needs assessment and an EHC plan are necessary for your child, they must carry out the assessment and issue a plan whatever your views are. SSIASS can give you impartial information and advice about the options open to you, and support you through the process. You also have a right to request independent disagreement resolution and, in some circumstances, mediation. You can find out more about disagreement resolution and mediation at in the SEND Code of Practice Chapter 9. Between September 2014 and September 2018 local authorities will gradually transfer Statements of Special Educational Need to the new system. When this happens for your child an EHC plan transfer review will take place. The review will involve an EHC needs assessment. You, your child or the young person must be invited to a meeting as part of this transfer review. Your child’s existing Statement, review reports and other information may be sufficient for the needs assessment as long as you, the local authority and those providing the advice agree that they are. If there is not agreement that they are sufficient, the local authority must gather more information and advice. You can read about Education, Health and Care needs assessments in the SEND Code of Practice Chapter 9. The Local Offer includes more information on the local arrangements for EHC needs assessments. information, advice and support about your rights to make a complaint, seek independent disagreement resolution or mediation.